Today I’m excited to team up with DESSANGE Paris – the iconic haircare brand fresh from Paris – to show you how to recreate these Parisian inspired messy-chic, loose waves. Step 1: I washed my hair with DESSANGE Paris Oleo Miracle Shampoo and Conditioner. Step 2: I applied the Oleo MiracleReplenishing Oil throughout towel dried hair – this product is great for nourishing hair, without weighing it down. A little goes a long way so you only need a few drops (and it smells amazing too). Step 3: I blow dried my hair and set it with hairspray to add some texture and to help the curl hold. Step 4: I wrapped about an inch of hair from the root to the ends in a spiral motion. Make sure your iron is always pointing down and hold hair for about 15 seconds. (I don’t use the clamp at all, I hold the clamp open with one hand and hold the end of my hair with the other). Step 5: I finished it off with hairspray (go light on the hairspray so your curls don’t get crunchy). For a more relaxed look, comb through your curls with either a brush or your fingers. Brought to you by DESSANGE Paris. Your hair always looks beautiful! Thanks for sharing! Great tips! Your hair always looks so amazing, thanks for sharing with us! You have the prettiest hair Rach! I’m always jealous of your perfect curls :) great tutorial!! Very cute! I love loose curls! 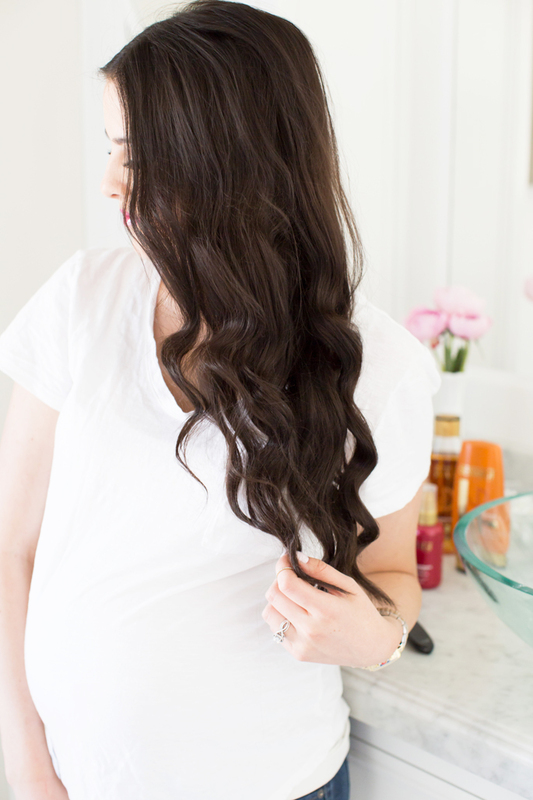 Easy waves are the go-to hair style for the season! Great tutorial! Beautiful curls! Thanks for the tutorial. 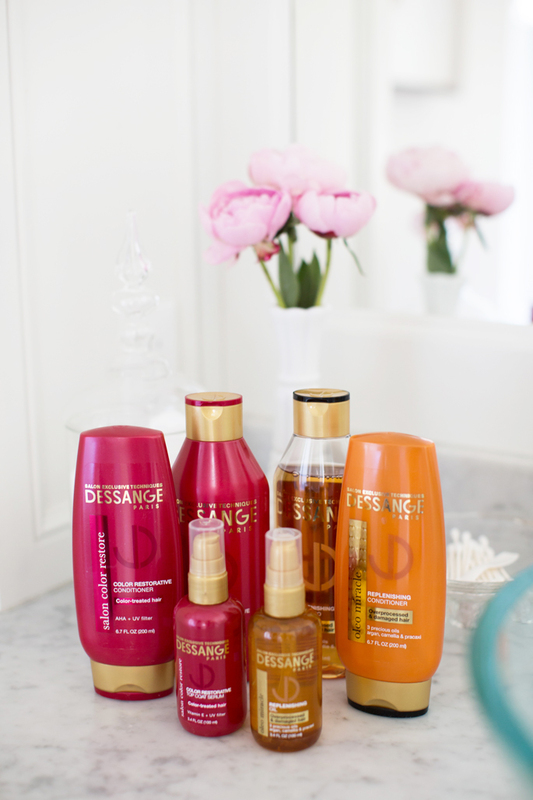 great tutorial,thanks for sharing it :) dessange is such a huuuge brand here in Luxembourg, I guess everyone knows it here and their products are really one of the best around. 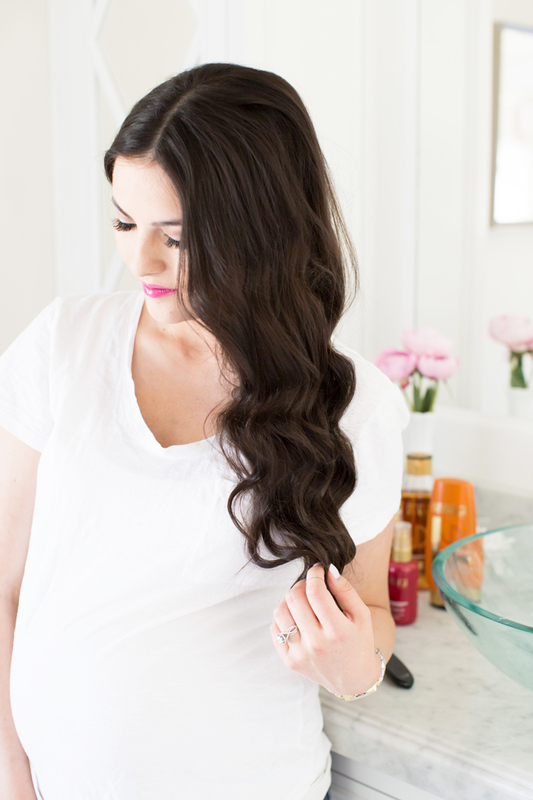 I’ve never heard of this line of hair care products, but they really do help create gorgeous waves! Love this hairstyle! You look great! Great tutorial! And love your dog in the pictures. I have a 10 year old yellow lab that looks very similar! So pretty! I love the length of your hair, girly! Such a great tutorial! 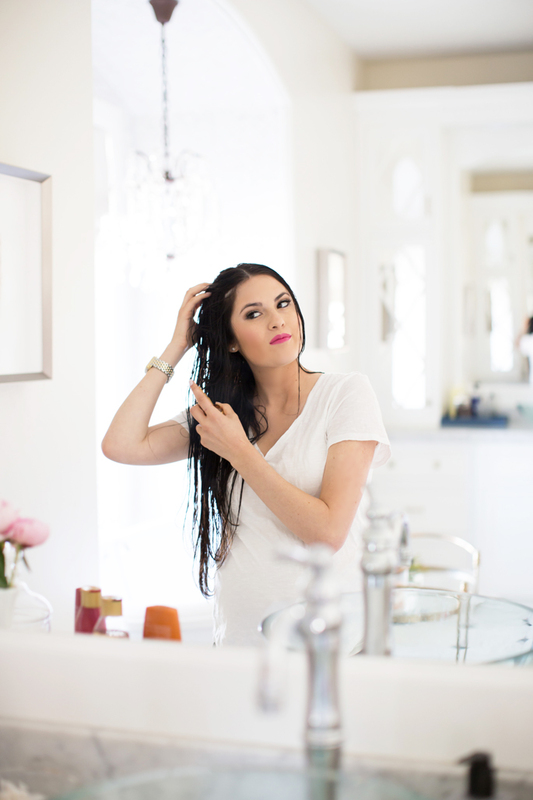 Your hair looks beautiful like this, thanks for sharing your tips! I love those products!! I currently use the shampoo and conditioner but will have to try the other products too! I’ve only tried their California Blonde stuff to fight brassiness on my ombre and I love it! I must check out more! Beautiful hair style and it looks great on you! Thanks for sharing this how to! This is perfect timing! I’ve been needing some new hair products! thanks for sharing! Beautiful, you look so lovely with that belly bump! I love that Dasher is hanging out at your feet! My lab mix does this also. The hair products look so dreamy! Will definitely have to test them out! Wow I will have to try this out! I have also been holding my curling wand the wrong way this entire time, ugh! Thanks for this post! So glad I don’t have hair tutorials on my blog haha! Beautiful hair! What kind of curling iron were you using? Such a pretty end result Great tutorial! Love this! Your hair looks gorgeous! The replenishing oil looks amazing! Wow such beautiful hair, I have never heard of this product before, I will have to try it out! Have a great day. Thank you for letting us in on your hair secrets! Your hair always looks amazing, so I will definitely be testing these products once my hair is long again. what a babe. wishing you all the luck in the world, with your new baby girl coming soon! I love your hair with curls like this! I think someone else asked to but what type of curling iron do you like? My super old on burnt out recently and am not sure what new one to purchase. Thanks in advance! Great product and tutorial.You look beautiful! I have never heard of this brand, and since I love anything Parisian, I can´t wait to try it! I would love to try the blonde lightening line! Thanks for sharing! Love love love their products! Thanks for sharing your loose curls tips :) You look fab! Your hair is so long and beautiful!! What blow dryer do you use? I have really thick and long hair, so I’m in the market to find a powerful one. Thank you for this wonderful post on how you create your beautiful waves!! You have such gorgeous hair!! 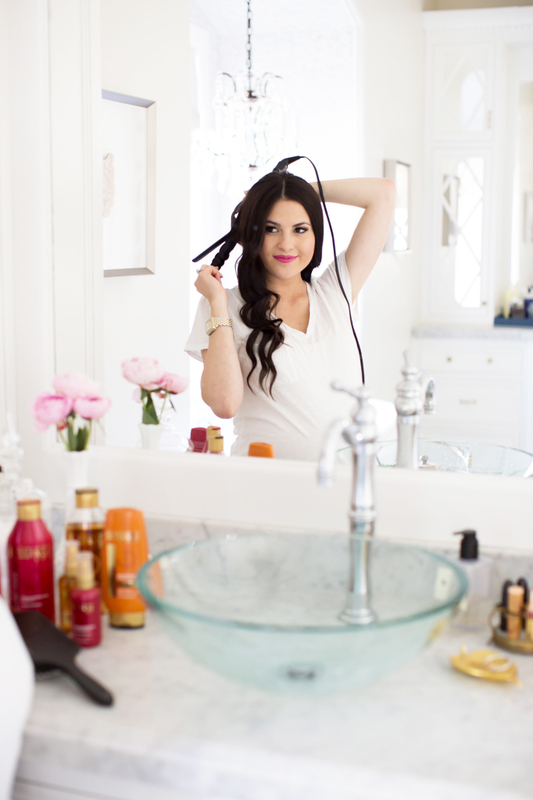 Your hair is gorgeous (and so is your bathroom!). Thanks so much for sharing, I’ll have to give these tricks a try! Love the post! You are so beautiful..